Need an effective tool for removing grease and char from your grill or griddle surface? Featuring a slanted blade, this Tablecraft 254 8" grill scraper with a 4" stainless steel blade removes grease or baked-on food without scratching your grill's grating. The sharp edge and ergonomic design provides maximum scraping power, so you can clean your dirtiest grill and scrape sheet pans clean. This is a heavy duty grill scraper. It has a nice wood handle that doesn't get too hot if let by the grill. It is great for keeping the griddle clean. Excellent, excellent, excellent. I've had a very tough time buying a good quality scraper for my griddle. we primarily use this for shaving steak and the great thing about this one is that it is very sturdy and doesn't rattle in your hand. It may have taken me a few years and a few sub-par products before finding this one; i'm just glad I finally did. If you have a flattop griddle... You definitely need this handy Grill Scraper. It removes all the stuck on food left after cooking. It is a great tool to have. Very heavy duty for the price. I use it on my flat top griddle for helping move food and to clean between items Well worth the good price. Great quality, sturdy, sharp and ready to use. Works great to replace our old waffle scrapers and great for cleaning the flat top. Would certainly recommend to anyone at the price listed. Great bargain. Nice scrapper with a solid handle. The metal is thick and sturdy. I've paid more for worse scrapers, thats for sure. I did have to grind down the edge a little to get it flat - the edges were a little poked out and didn't let me scrape evenly. Very sturdy standard scraper. Do not wash in a machine because of the wooden handle. Very useful for heavy duty cleaning. I would definitely recommend. This scraper has made it really easy to clean our grill. You do not have to apply too much pressure, which is nice. Durable and has been withstanding our daily usage of it. This is a heavy-duty scraper, I am over satisfied with this scraper. It is stiff, and the edge is sharp enough to open bacon or hotdog plastic packages. When using it to clean griddle, it takes almost everything off, and leaves the surface needing only a wipe down with a paper towel. These have the best use for us when we use 2. One on each hand to gather and serve our food . they also work great for scraping up when it's clean up time. we use this for our sheet pans in the dish area. works great. the repetitive water logging does not affect it at all. holds its own. I bought this scraper to use for slab tempering chocolate and got much good use out of it before switching to a different tempering method. I still use it to scrape hardened chocolate off of flat surfaces. The handle allows for a much more comfortable grip than a traditional bench/pastry scraper, making repetitive work significantly easier on the wrist. The blade is even, thick, and strong. The handle is a little loosely riveted to the metal blade but not in a way where it would actually fall off, so I won't take any stars off for that. I call it pot scraper.I use this mainly on heavy duty pots It works like magic.I love the short handle.it also works well with small pot.must have. the quality of the 4" blade is better than what i thought. we use it to make crepe, or take some grease away. the blade is sharp and useful. This is a nice scraper. It works really well for scrapeing off sticky items off the griddle. We use it every day in our kitchen. Nice scraper with 4 inch blade. Does the job well. And, love the wooden handle. Sturdy and strong. Can't go wrong. And the price is right on! Sharp sharp sharp! It was so sharp I used to to open my boxes. Great for scraping flat top griddles or whatever else you can find to use it for. This one worked exactly as we expected. Great product. Would recommend to anyone who has a flat top grill. WE use this after cleaning the grill. This scraper is perfect for cleaning stuck on food on our grill and flattop. The wooden handle is also a great feature so that the handle doesn't get too hot near the heat. This is a very affordable high quality scraper. I use it to scrape down the flat top throughout the day before the end of day cleaning. This scraper makes the best of grill cleaning! Makes my job much easier. Very sturdy and nicely made, great product with another awesome, low price! This is a very nice tool for our fryer, we use this Scraper taking away crumb from the edge of the oil during working, it is very strong, we love it! This item came in a little smaller than I imagined but that's my fault. We use it for scraping our flat grill. The employees call it their "favorite kitchen utensil." The tablecraft scraper is another great item, we use it to scrape the grill inbetween food orders. We have had this for about a year and it i still working great. This metal scraper is great at removing any caked on material. The wooden handle is comfortable to the hand and its very durable. Great product. This is a nice tool for cleaning a griddle in between orders! 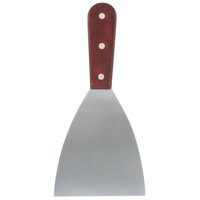 Great for tempering chocolate on a marble slate!! Very affordable and well built!!! This works exactly as we expected. Great product. Would recommend to anyone who has a flat top grill. WE use this after cleaning the grill.